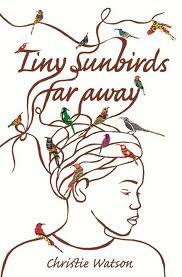 Book Review: Christie Watson's "Tiny Sunbirds Far Away"
I'm going to be honest, I didn't start off liking Tiny Sunbirds Far Away and it took me a while to get into it, but by the time I was done I actually ended up liking it. Christie Watson really did do her research, and although she isn't Nigerian, and I could tell while reading it that this wasn't someone who grew up in Nigeria, this was a book which tackled certain issues in Nigeria that some Nigerians themselves are not willing to talk about. 12 year-old Blessing and her 14 year-old brother, Ezekiel leave their comfortable life in Lagos after their mother finds out about their fathers affair with another woman. They are forced to move to the village in Warri and live with their grandparents in the Niger-Delta region. Blessing initially doesn't like the move to Warri - the poverty, the dirt and she is confused about so many things. But as time goes on, she adapts to life in the village, she begins to love it and starts to see Warri, her grandparents and her new life in a positive light. The move to Warri doesn't only affect Blessing, it also affects her mother, Timi, and her brother, Ezekiel. Through her eyes we see not only the political issues that go on in the Niger-Delta region, the anger young men have towards the oil companies, and the continuation of a harmful traditional practice that has not yet stopped in certain parts of Nigeria, but also the conflict that goes on in a family that has obviously suffered from an adulterous father and having to shift from a privileged lifestyle to a not-so privileged one. In addition to Blessing, Ezekiel and Timi, there are also some interesting characters in the story - the grandfather, Alhaji, who thinks marmite can cure everything; the grandmother, a traditional birth attendant; and Celestine, Alhaji's second wife who loves Lycra. We get to know them all and none of them seem like secondary characters. To be honest, it is Timi who felt like a secondary character - she wasn't really around and we didn't really know much about her. Although I would have liked to learn more about Timi, I felt her not being present worked well with the story as she was a sort-of absent-mother and there were consequences to her absenteeism. I love that Christie Watson wrote a novel that went a little deeper into the Niger-Delta situation and looked at the impact it has on communities. I usually don't like giving too much away, but one of the parts of the book I thoroughly enjoyed was towards the end when Grandma and other women in the community are protesting against the oil company. It reminded me of the protests against Chevron Oil in 2002, when women organised peaceful sit-ins. Women have always used dance and music to ridicule unjust practices or nakedness to shame the government and I really liked that she included that in the story. As women have played important roles in protesting against the harmful practices of oil companies in the Niger-Delta region and the impact of oil on the community, the inclusion of that in the novel made me smile. Although I was extremely squeamish while reading it, I also like that she wrote on the harmful practices of female genital mutilation (FGM) that still happen in certain parts of Nigeria. It took me a while to get into it, but in the end I really did enjoy it and it turned out to be a surprisingly good debut novel. I think this is an interesting and informative read with diverse and yet topical issues raised. FMG is still pratised in parts of Ghana. Thanks for sharing. @Nina - You're welcome. Hopefully it doesn't take you as long as it took me to get into it. And I do hope you enjoy it when you finally get the chance to read it. @Reading Pleasure - You're welcome! And she really does touch on some very important issues.